Look and Ponder, From Art You Will Learn. In this month's ad/blog we feature eleven objects spanning some 270 years starting from about 1660 up to around 1930. 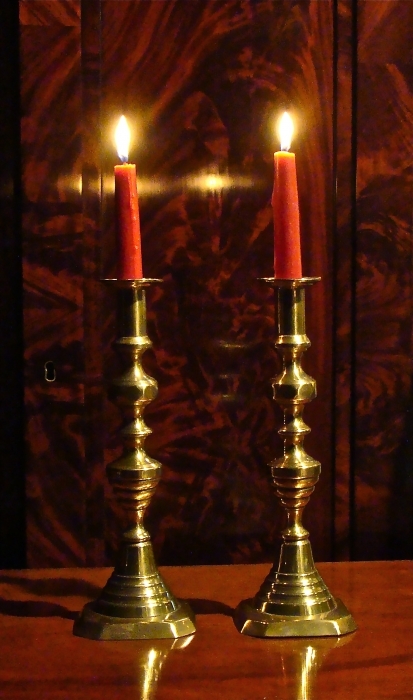 The single English brass candlestick is the earliest piece. 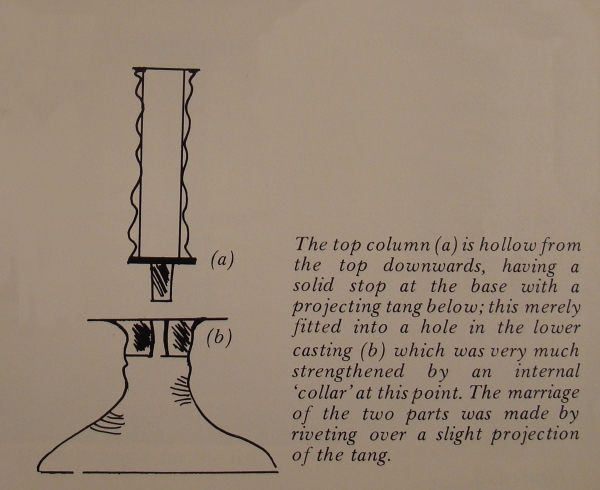 It is a Charles II trumpet based mid-drip candlestick with "sausage" or ribbed turning. When the stem is ribbbed like this it dates to around 1660. If the stem was smooth it would be slightly earlier, about 1650. It's fun to think of how many candles have burned over its 353 years, or 128,845 days. For a closer look click here. This trumpet-based candlestick is made in two parts and riveted or peened together just above the mid-drip pan. The drawing below shows a cross-section of this construction method. 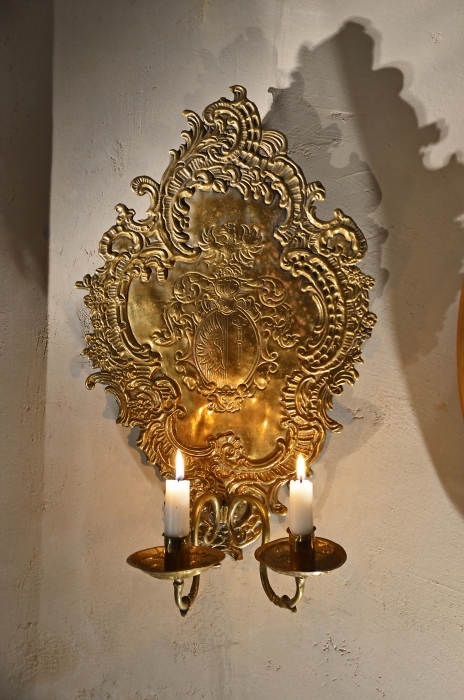 Flanking the chest are an amazing pair of brass pricket candlesticks. 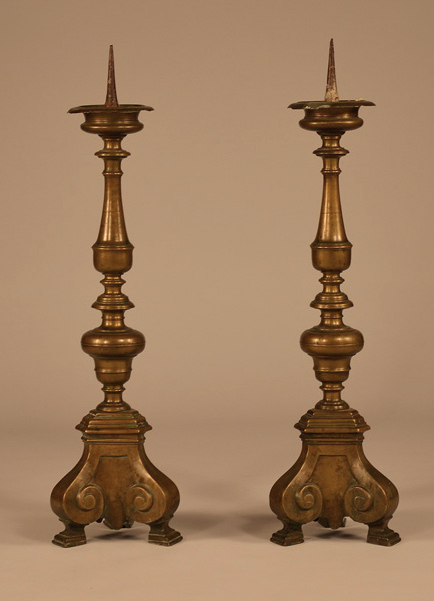 These ecclesiastical candlesticks measure 33 3/4 inches tall and have great color and patina. They date from the middle to late 17th century and are probably Flemish, although there's a small chance they could be Italian or German, for this type of stick was used throughout Europe from 1500 to 1700. 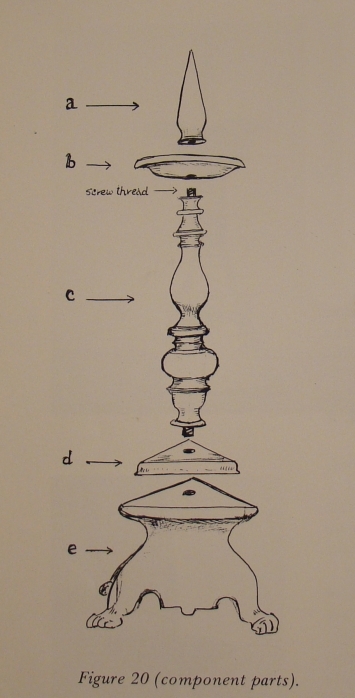 Pricket candlesticks are made in five parts. The base is cast in thirds and soldered together. Next is a triangular wedge between the base and the main column. 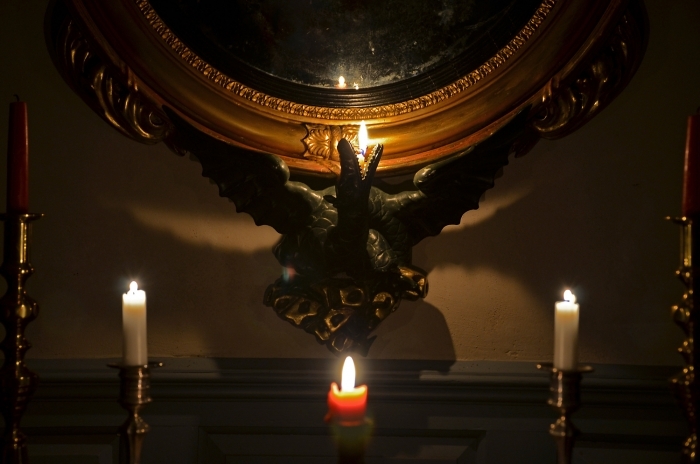 The top bowl collects the wax drippings while the iron pricket secures the candle. You can see here that these sticks have an iron rod that extends through the base with lead poured around the interior. The drawing below shows the five components. 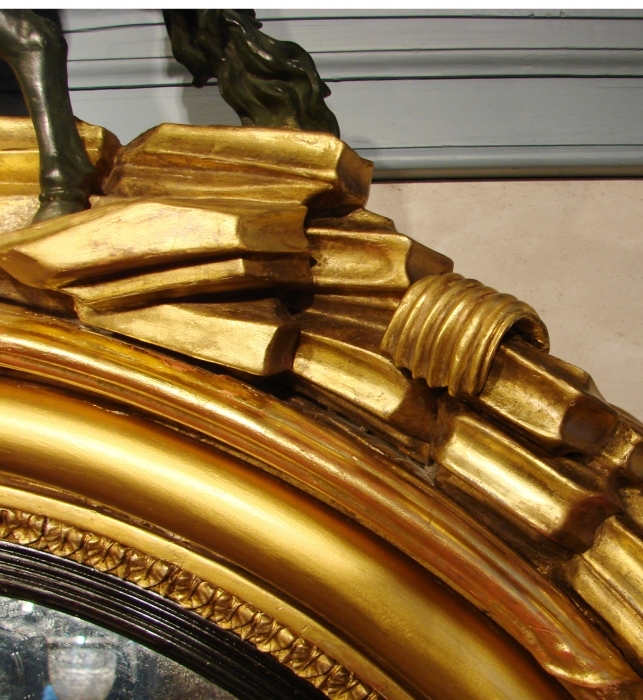 Most pricket-sticks are too ornate for my taste. This pair have very fine and beautifully shaped baluster turnings and scrolled feet. This pair of silver plate candlesticks were made in Birmingham England by the Barker-Ellis Company. 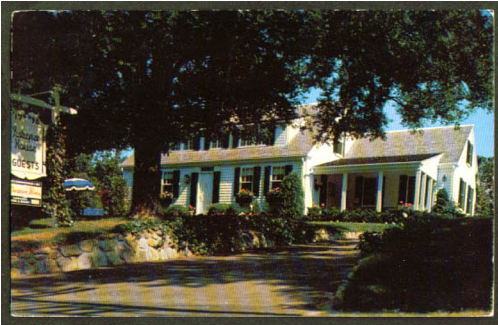 The company was first established in 1801 and remained in business untill 1992 when it went bankrupt. These candlesticks have a shell hallmark that was used from 1912 to 1932. For a closer look click here. The other pair are 19th century candlesticks from England. They have a diamond and bee hive shaped stem over a square base. 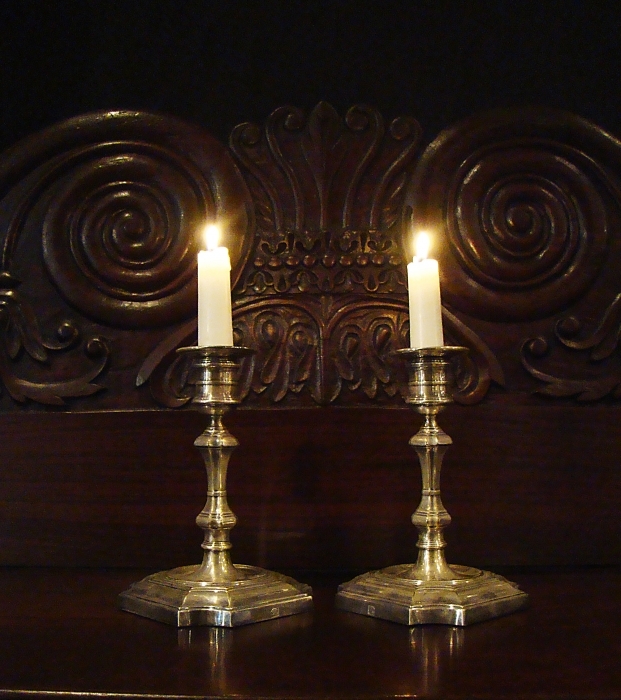 These decorative brass candlesticks are 12 inches tall and make great wedding gifts. 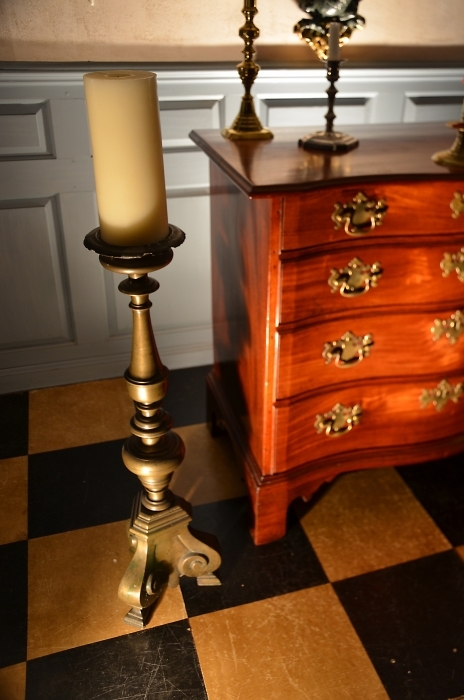 Next is a fine and dimunitive mahogany chest of drawers made in the Boston/North Shore area in the late 18th century. 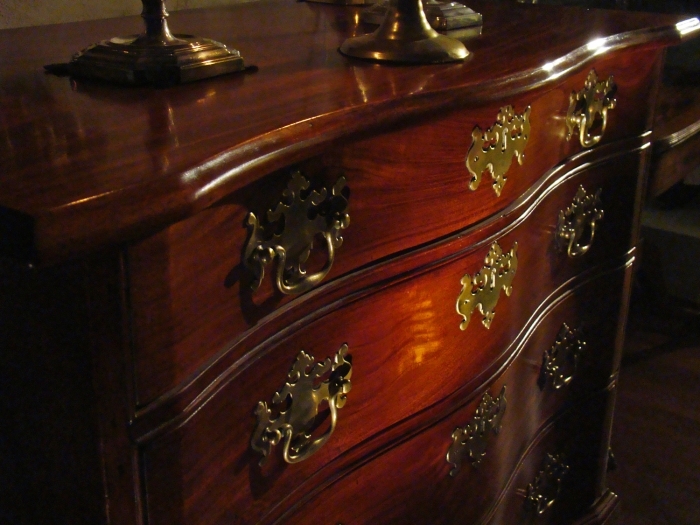 This chest has lively figured mahogany drawer fronts with bold graduation. The top drawer is almost half the size of the bottom. For more photos look here. This chest was purchased from the Stiles family of Fitchburg Ma. by Clifford Hanson a dealer in Westboro Ma. in the early 1960's. Below is the bill of sale to Mr. Hans G. Nagel on December 10, 1963. The front has a undulating blocked serpentine shape that invites you to glide your hand across the smooth polished top edge as you walk by. 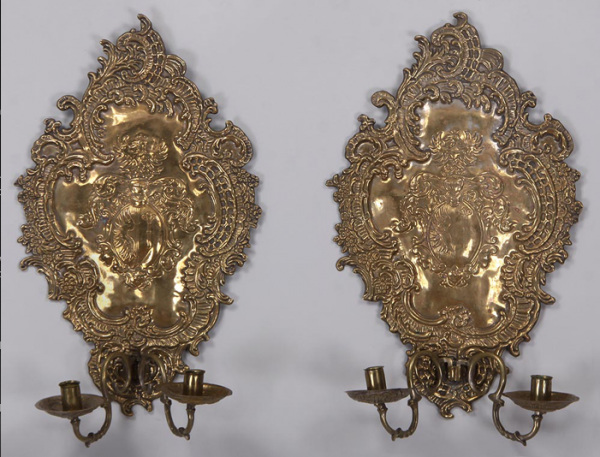 Here is a pair of 18th century Dutch repousse brass wall sconces. Repousse is french for "pushed up". The technique involves annealing a thin sheet of brass and placing it over a support. This support is usually made of pine pitch sometimes mixed with a variety of things like plaster of paris, brick dust, tar, pumice and beeswax. When cool, the pitch solidifies holding the metal sheet in place. The pitch supports the work while allowing the brass to be deformed. The design is drawn on and the surface hammered out using many different shaped metal punches. When the the basic design is complete the pitch is heated,washed off, and cleaned with turpentine. Then the finer detailed chasing work is done on the front. The decorative repousse and chasing create a shimmering jewel-like effect when the candles are lit and the flames about. 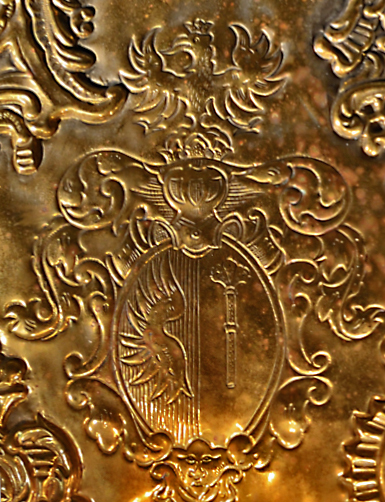 I have tried to decipher the center crest decoration but haven't come up with much so far. The vertical wings or vol means swiftness and protection. The object on the right could possibly be a scepter, a symbol of justice and royal authority. Please comment at the end if you know more? When your done reading this blog post, you should check out this video of Davide Bigazzi demonstrating the art of repousse and chasing. You can tell from his confident movements that he is quite talented. You will also be happy your neighbour dosen't practice this art form. Video is here. 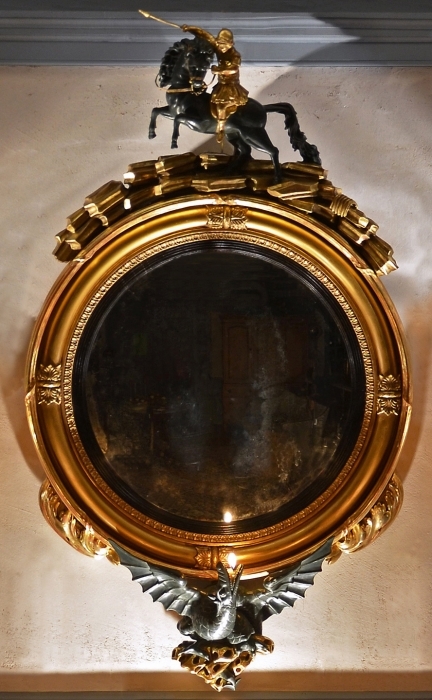 This amazing English convex mirror depicts the legend of St. George and the dragon. 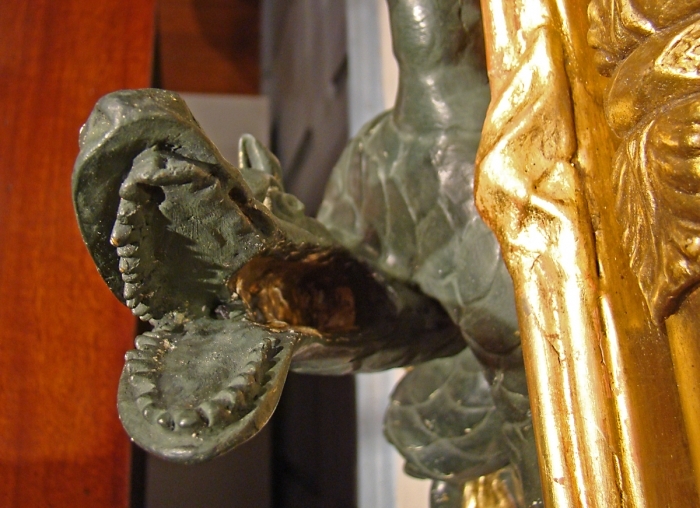 St. George is seated on his rearing horse, spear in hand, looking down at the evil dragon with its outstreached wings. The beautifully carved figures of St. George, his horse, and the dragon are very expressive and dramatic. Early writings of Euscbius of Caesarea in 322 AD tell of a soldier of noble birth that was killed by the Roman Emperor Diocletian. Fifth century writings tell of Diocletian beheading St. George, a tribune in the Roman army, for protesting the persecution of Christians. Through the tenth and eleventh centuries these stories of the brave St. George and his defense of the Christian faith begin to blend with other chivalric combat myths and grand tales of equestrian dragon-fighters. It's interesting to note that in ancient texts Diocletian is refered to as "the dragon". St. George is depicted here wearing Roman armor called pteruges. Pteruges are layered strips of flexible leather or fabric worn around the waist, torso, and upper arms like epaulettes. The legend of St. George and the dragon revolves around an ancient concept of the "withholding of the waters". In the Golden Legend the story takes place in "Silene" a place in Libya. Near the town's water supply lay a pestilent fire-breathing dragon poisoning the people with his breath. If given two sheep a day the dragon would not harm the people. When there were no more sheep a lottery was conceived to blindly choose a child to sacrifice to the dragon. One day the lottery fell upon the king's daughter. The town refused the king's bribe of gold and silver and demanded her sacrfice. She was dressed as a bride and led to the dragon. As the princess wept by the lake, fearing her future, St. George of Cappadocia rode by on his horse and proclaimed "Fair daughter, doubt not, for I shall help you in the name of Jesus Christ". Then the dragon appeared. In folktales St. George kills the dragon with one blow of his spear. In the Golden legend he wounds the dragon and subdues the crippled beast with the princess' girdle as a leash. They return to town with the dragon. St. George tells the frightened people of Silene if they become Christians and are baptised he will slay the dragon. They agree, fifteen thousand men are baptised, and the malevolent dragon is killed. The king builds a church in St. Georges honor. Suddenly a spring of living water burst forth beside the church healing all who drink from it. You can see below on the mirror the spring flowing from the rocks, "a vestige of the freeing of the waters". 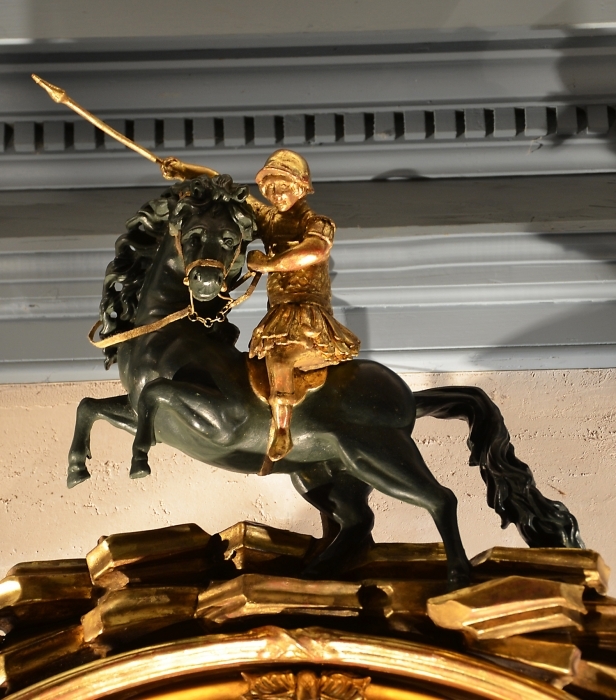 There is more to the Golden Legend of St. George; if you are interested look here. Another interesting feature of this mirror is the dragons mouth. You have probably noticed the flame. This isn't photoshopped. 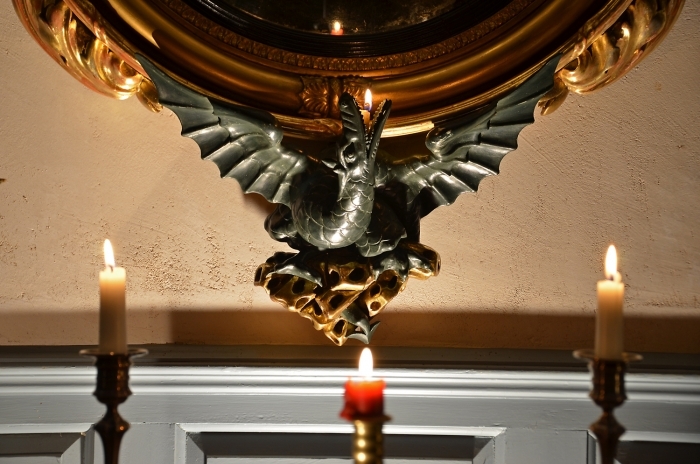 A channel was purposely carved out behind the dragon's neck to hold a candle just right for the flame to rise from it's mouth. 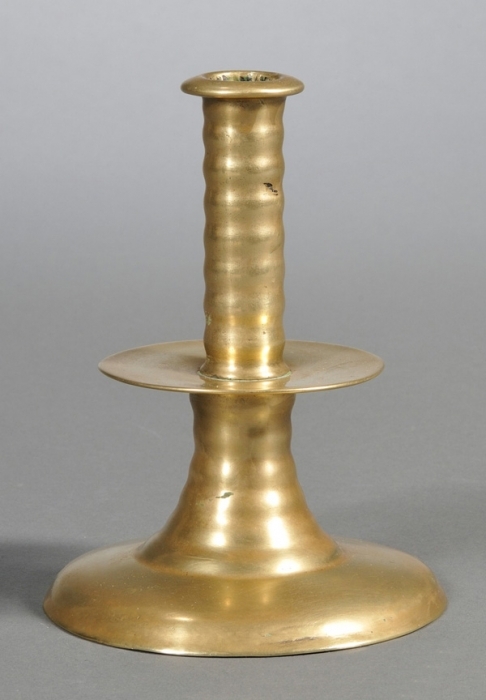 A metal spring loaded candle holder was probably used to protect the wood and to keep the flame at the right height. The story of St.George and the dragon is widely known especially in England. There are many paintings, engravings, sculptures, and tapestries commemorating St. George but very few images are incorporated into furniture designs. I have seen one other inferior mirror with a similar theme. It's intriguing to speculate that some event may have triggered the inspiration for this design around the time this mirror was made, 1815-1820. 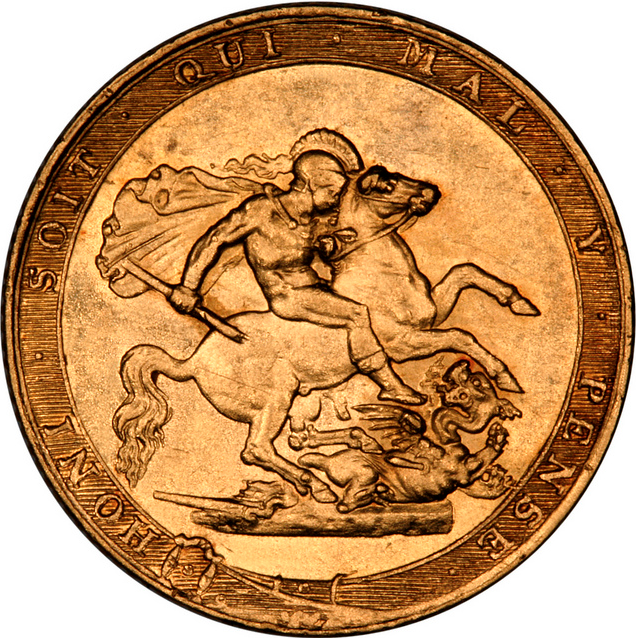 On April 28, 1818 Prince Regent, soon to be George IV, created the Most Distinguished Order of Michael and St. George to honor extraordinary service in a foreign country. At the time it was intended for natives of Malta and the Ionian Islands in the Mediterranean. Google's n-gram viewer searches 5.2 million digitized books that have been published between 1500 and 2008. 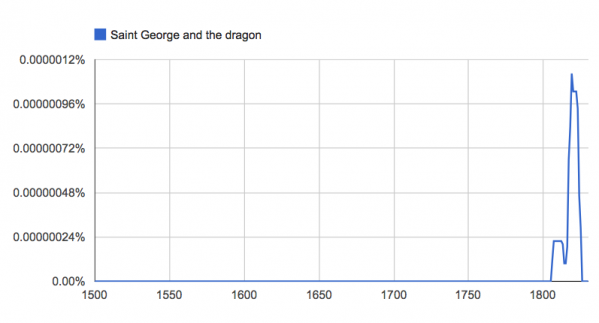 Although there are many limitations and flaws to this search, a quick look for books mentioning Saint George and the dragon produces an interesting graph spiking around 1820. You can never know for sure the motivation behind a mirror like this. It's fun to think that external events like the ones mentioned above brought the story of St. George and the dragon to the forefront of the maker's mind and helped spark the inspiration for this unique mirror. 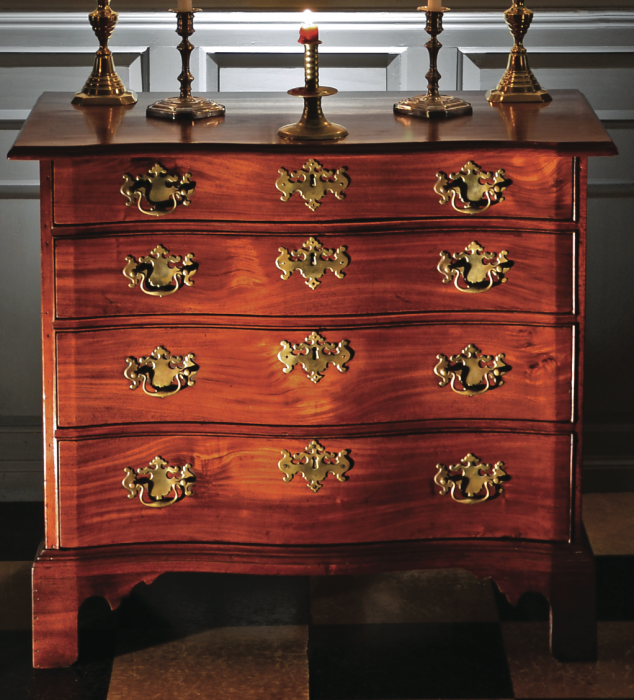 Loved learning about this beautiful furniture and the legend of St. George.